This volume, like its companion, Voices of Our Times, collects essays drawn from a series of public conferences held in autumn 2011 entitled "More than a Monologue." The series was the fruit of collaboration among four institutions of higher learning: two Catholic universities and two nondenominational divinity schools. The conferences aimed to raise awareness of and advance informed, compassionate, and dialogical conversation about issues of sexual diversity within the Catholic community, as well as in the broader civic worlds that the Catholic Church and Catholic people inhabit. They generated fresh, rich sets of scholarly and reflective contributions that promise to take forward the delicate work of theological-ethical and ecclesial development. Along with Voices of Our Times, this volume captures insights from the conferences and aims to foster what the Jesuit Superior General, Fr. Adolfo Nicolas, has called the "depth of thought and imagination" needed to engage effectively with complex realities, especially in areas marked by brokenness, pain, and the need for healing. The volumes will serve as vital resources for understanding and addressing better the too often fraught relations between LGBTQ (lesbian, gay, bisexual, transgender, and queer) persons, their loved ones and allies, and the Catholic community. Inquiry, Thought, and Expression explores dimensions of ministry, ethics, theology, and law related to a range of LGBTQ concerns, including Catholic teaching, its reception among the faithful, and the Roman Catholic Church's significant role in world societies. Within the volume, a series of essays on ministry explores various perspectives not frequently heard within the church. Marriage equality and the treatment of LGBTQ individuals by and within the Roman Catholic Church are considered from the vantage points of law, ethics, and theology. Themes of language and discourse are explored in analyses of the place of sexual diversity in church history, thought, and authority. 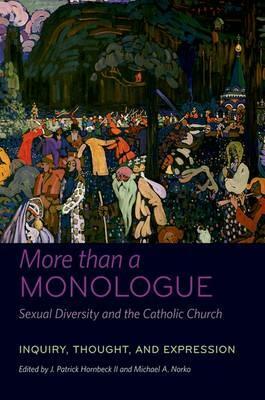 The two volumes of More than a Monologue, like the conferences from which they developed, actively move beyond the monologic voice of the institutional church on the subject of LGBTQ issues, inviting and promoting open conversations about sexual diversity and the church. Those who read Inquiry, Thought, and Expression will encounter not just an excellent resource for research and teaching in the area of moral theology but also an opportunity to actively listen to and engage in groundbreaking discussions about faith and sexuality within and outside the Catholic Church.